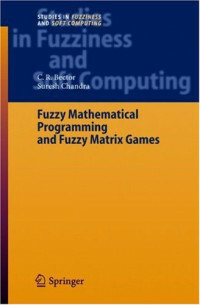 This book presents a systematic and focused study of the application of fuzzy sets to two basic areas of decision theory, namely Mathematical Programming and Matrix Game Theory. Apart from presenting most of the basic results available in the literature on these topics, the emphasis is on understanding their natural relationship in a fuzzy environment. The study of duality theory for fuzzy mathematical programming problems plays a key role in understanding this interrelationship. For this, a theoretical framework of duality in fuzzy mathematical programming and conceptualization of the solution of a fuzzy game is created on the lines of their crisp counterparts. Most of the theoretical results and associated algorithms are illustrated through small numerical examples from actual applications. This book, Basic Decompositions, is the first volume in a projected five-volume series entitled Matrix Algorithms. The other four volumes will treat eigensystems, iterative methods for linear systems, sparse direct methods, and special topics, including fast algorithms for structured matrices.